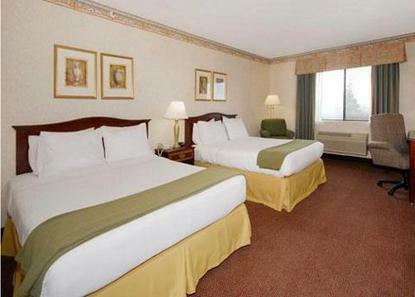 The Holiday Inn Express Hotel & Suites Newark is 20 minutes from Downtown San Jose, San Jose International Airport (SJC), San Jose Convention Center and minutes from the central business centers of Fremont, Newark & Union City. The hotel features a large inviting atrium lobby with Mediterranean decor. Shopping and movie theaters are just a walk across the street at the New Park Mall -- featuring major department stores, shops and food court. Sizzler and the Bombay Garden serve lunch and dinner and are in the same parking lot as the hotel. Within minutes from Pacific Research Center, GE Security, Nummi Auto Plant. This hotel is committed to providing accessible facilities under the American Disabilities Act. If your accessibility needs are not met, please contact the Hotel Manager on Duty. Should you require additional information regarding accessible facilities for guests with disabilities, please call 1-800-Holiday (U.S. and Canada) or contact the hotel directly. For the hearing impaired, TDD service is available at 1-800-238-5544 within the U.S. and Canada.